Table tennis has never looked so stylish! The ultimate statement piece, the Amsterdam has all the trappings of modern style, plus a healthy dose of fun! 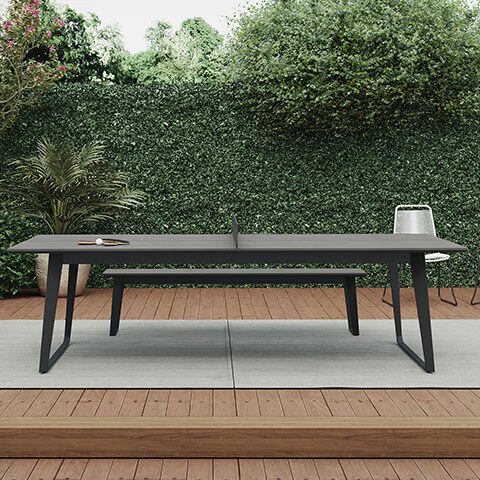 The expansive top is crafted from a state of the art blend of concrete and fiberglass, creating a durable surface perfect for the outdoors! 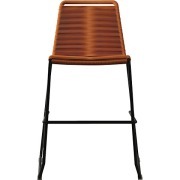 Powdercoated steel legs and frame give Amsterdam a stylish, sturdy base. Pull up a few Amsterdam Outdoor Benches (sold separately) for outdoor dining, or add the mod net - a precision-perforated laser cut steel sheet, melding form and function - and let the tournament begin! Includes two handcrafted bamboo paddles. Ball sold separately. Did you know that table tennis was originally developed as a way to bring the game of tennis indoors during the winter? Far before the television or the Internet, people had to invent new ways to entertain themselves, especially during the cold winter months - and table tennis, now known as ping pong, was one of the results. It grew in popularity as a parlor game in the 1800s. In the late 1800s and early 1900s, people started holding ping pong tournaments, and the game spread all over the world. 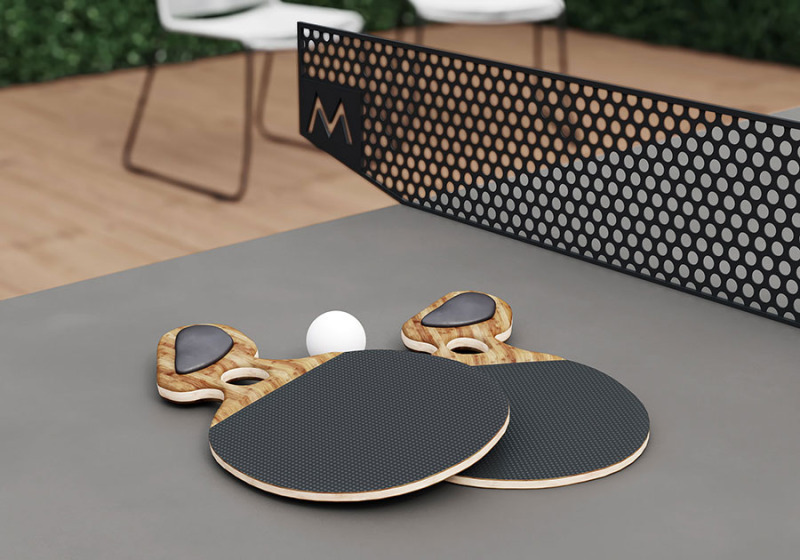 Ping pong has gone through some changes over the years as people tweaked the size of the table, the height of the net, the shape and material of the paddles, and more. Now, it's quite standardized. The game has long been popular with college students in America (beer pong, anyone?) but it's truly a sport for all ages. Children play it in their physical education classes at public and private schools. Ping pong tables are common at community centers and recreational facilities. And, across the world, many homes have a ping pong table that acts as a gathering spot for friends and neighbors. For the last few decades, table tennis has even been an Olympic sport. But the magic of the game is that it’s far from elite. Anyone from children to the elderly can play it, and it can be fun even if you're not particularly great at it. It's not just limited to athletes! And now, it's not limited to the indoors either. 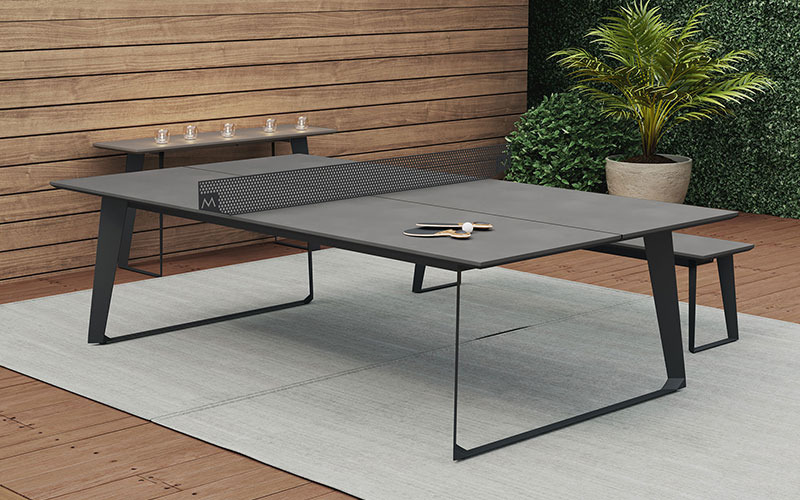 You don’t have to have your own full-sized tennis court to have fun outdoors; you can add a stylish outdoor ping pong table instead! Any patio or backyard could benefit from an extra dose of fun! Whether you're looking to spice up a boring patio with some outdoor entertainment or you want to add an activity to your poolside area, an outdoor ping pong table is something that your family and friends can enjoy for years to come. And, it's somewhat of an unexpected patio piece. An outdoor table tennis area is something that few people have, and it'll make your gatherings the talk of your friend group! 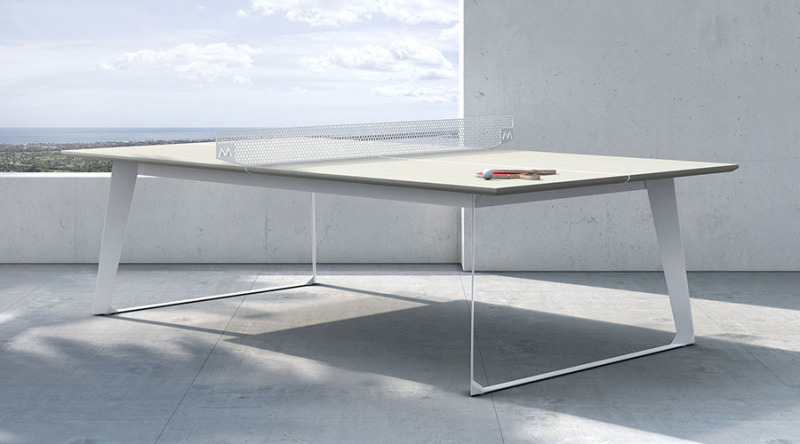 Outdoor ping pong tables are often a lot more feasible than indoor ones, for several reasons. Although outdoor ones might be more of an investment, they don't take up your valuable indoor square footage. They allow you to enjoy warm summer evenings, crisp fall afternoons, and sunny spring days playing outdoor table tennis in the fresh air. And, it's a great activity for parents when you're hosting a gathering for the whole family. While the kids are swimming in the pool or playing in the backyard, the adults can keep an eye on them while also having their own activities to do. 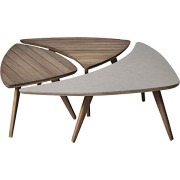 Outdoor furniture takes a beating from all the elements: wind, rain, the UV rays from the sun. Even if your table will be protected under the roof of your patio, deck or balcony, you still need to consider the weather. A normal ping pong table would quickly be ruined by humidity, sun, and other elements - the top would fade and warp and the legs would probably rust. So, be absolutely sure to choose something that's built for the outdoors: rust-proof, low maintenance, and highly durable. Click here for EXCLUSIVE SAVINGS on Amsterdam! Cheap outdoor furniture might not even last until next season, let along for years to come. Not only are you purchasing something that's going to be outdoors, but you're buying something that will likely get used heavily. It's likely that your ping pong table will have to stand up to some roughhousing in addition to the elements - so find something high quality so it'll look fantastic and stand the test of time. Do you enjoy getting the most bang for your buck? We agree! If you're going to make an investment in something for your home, it's a good idea to find something that's hardworking and useful for multiple functions! Some ping pong tables, like this Amsterdam Outdoor Ping Pong Table, can convert to regular dining tables if you simply remove the net and add some benches or chairs. If you ever think you'll need to seat more people than you have space for, consider purchasing a ping pong table that can easily turn into extra room for people to sit and eat! We think that the Amsterdam Outdoor Ping Pong Table is the ultimate choice for outdoor table tennis! 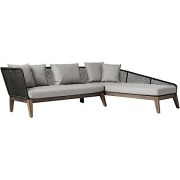 It blends form and function perfectly - here's why it should be a top contender in your search for the perfect outdoor furniture piece. 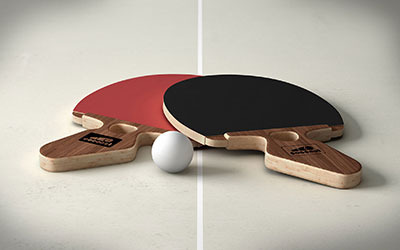 This piece is built to last, no matter how much roughhousing goes on during your home table tennis tournaments! 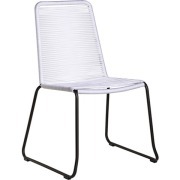 The metal legs are welded for quality and stability, and the entire piece is completely rust-proof—so you won't have to worry even if you live in a humid environment. And, the heft of the fiberglass/concrete table ensures that the table will stay in place even in the strongest wind storms. It won't warp or chip and is designed for all weather with no maintenance required. With the addition of the Amsterdam Outdoor Benches, which are sold separately, you can dine al fresco at your Amsterdam Outdoor Ping Pong Table! 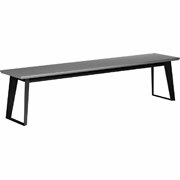 This is excellent if your patio or balcony doesn't have room for a large dining table. 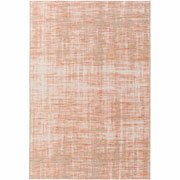 Or, if you like to host large gatherings, it can function as a second table when needed. Just remove the net, pull up the benches or some extra chairs, and you're good to go! It looks beautiful when styled as a dining table—people wouldn't even know it was a ping pong table if you didn't tell them. Let's face it: Most table tennis tables are far from attractive. The average one is simply not designed for aesthetics. But the Amsterdam is different! 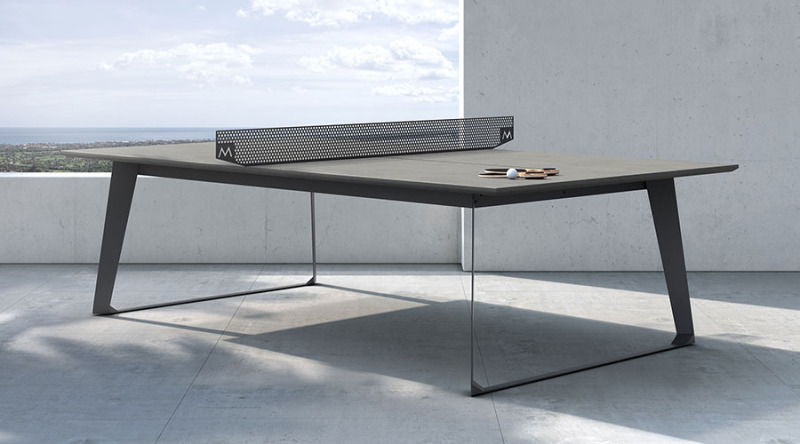 This ping pong table has all the clean lines and stunning finishes you'd expect from a high-quality piece of modern furniture, with the added bonus that it's a whole lot of fun! 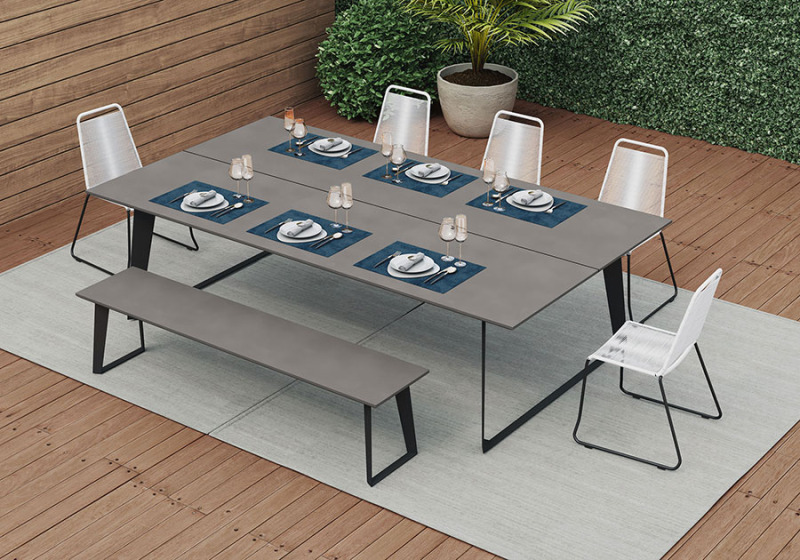 The powder-coated metal legs give the table a modern appeal, and the smooth, concrete/fiberglass blend table top has a timeless matte finish. The sturdy net is made of a perforated steel sheet that is laser-cut with a pleasing honeycomb design—far more durable and stylish than your run-of-the-mill netting! 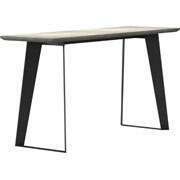 Since this table is made of powder-coated metal and a concrete/fiberglass blend, it does not need any maintenance like some materials (such as wood) might. Ideally, if your area has cold winters in which you won't be using your ping pong table, you should cover or store it indoors to ensure it stays safe. A cover is useful if you want to keep it clean and free from any debris (like fallen leaves, dust or pollen). 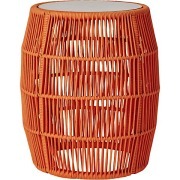 And, like most outdoor furniture, it will fare better if it's in a sheltered area so it isn't facing the full brunt of the elements at all times. However, this piece is built to last! The Amsterdam Outdoor Ping Pong Table is 9 feet by 5 feet (108 inches by 60 inches), which is the regulation size for tournaments. This table is certainly good enough for the pros! Even if you're not an Olympic hopeful or a pro table tennis player, it'll be great for low-key tournaments with friends and family in your backyard. It's high-quality enough to stand up to thousands of ping pong matches. 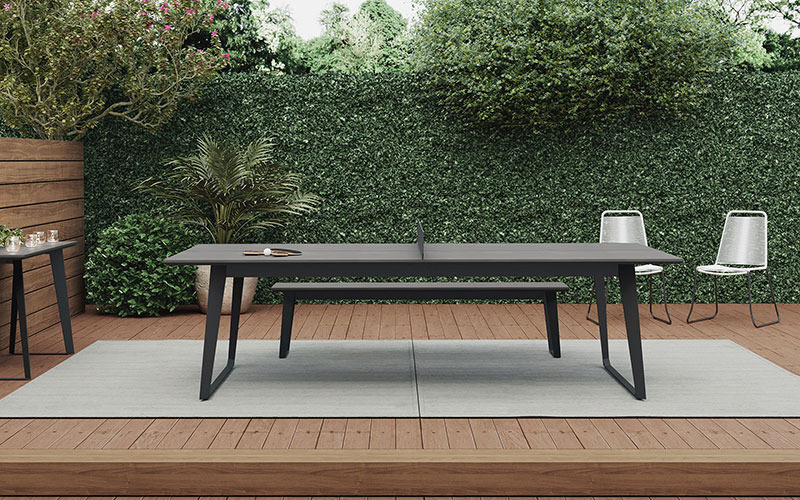 The Amsterdam Outdoor Ping Pong Table is available in two designs: a stylish, warm gray tabletop with black legs and net, or a light and bright sand-colored tabletop with white legs and net. Both look fantastic—it just depends on the aesthetic you're going for! If you are having trouble deciding (and we can't blame you; they both look great! ), you can take a look at your other patio furniture and the overall look of your patio to help you decide. As a fun bonus, this table comes with two handcrafted bamboo paddles that look fantastic and are comfortable to use. These paddles have rubber padding to put the perfect spin on your ball. The handle has a precision-style grip with a comfortable, custom foam insert so you can play all day. If you're left-handed, no worries: this paddle is well-suited to right and left-handed players. We can't promise that these rackets will turn you into a ping pong master, but with your beautiful new table, you'll get plenty of practice! Click here for EXCLUSIVE SAVINGS on the Amsterdam! The Amsterdam Outdoor Ping Pong Table would be a wonderful addition to a community center, library, playground, school or university campus, nursing home, or office. It'll look great and provide hours of fun no matter where it is located. And, since it's weatherproof and maintenance free, it can be a worry-free addition to any outdoor space.